Cards are made with durable, high quality PVC plastic and measure 2-1/8" x 3-3/8". Thickness is available from .018" to .030"(standard thickness). 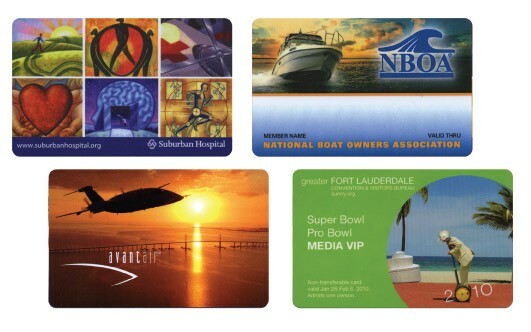 Plastic cards are used in every industry today. For instance banks, restaurants, hotels, hospitals, country clubs, association, universities, corporations, retail stores, etc. have a need for plastic cards. All our products are manufactured at our facility in the U.S. and we guarantee customer satisfaction. We offer many personalization options such as embossing, magnetic striping, barcoding, thermal printing, scratch off labels, consecutive numbering, photo identification, etc. Allow us to be your source for all your plastic card needs! Price below is based on 4 color process front x 1 color back.